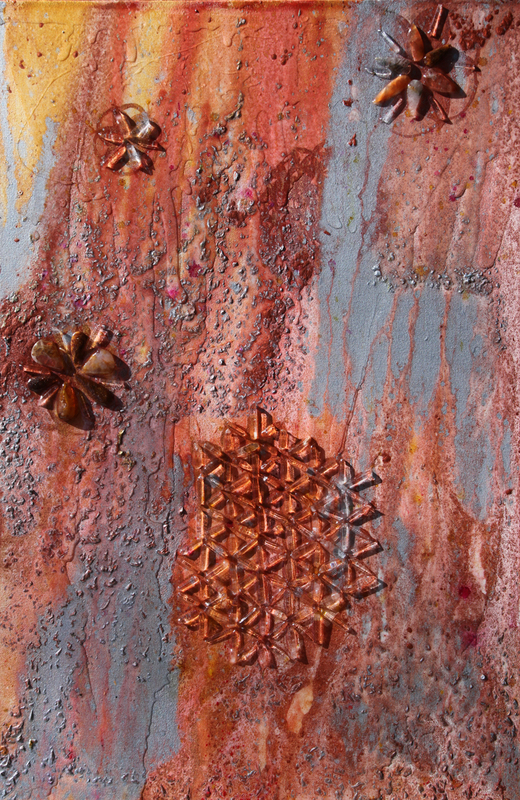 I started embedding crystals in my paintings to produce a healing effect and because I love them. 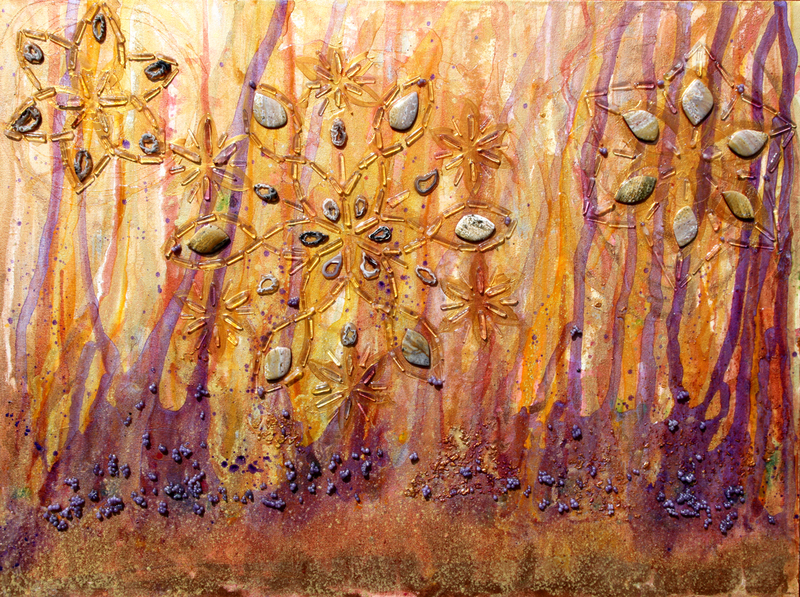 Gemstones have become an integral part of my research and art making. Taking courses in Crystal Vibrational Science, Unified Field Theory and Sound Healing, I followed my passion into areas of suppressed science, energy, healing and meditation. This research attempts to describe the spiraling geometry of the universe that is both fractal and holographic. I have always been concerned with origins, and I find many answers and questions arise in natural patterns and sacred geometry. Spending time in nature, helps me feel alive and connected to the Earth and the Universe. 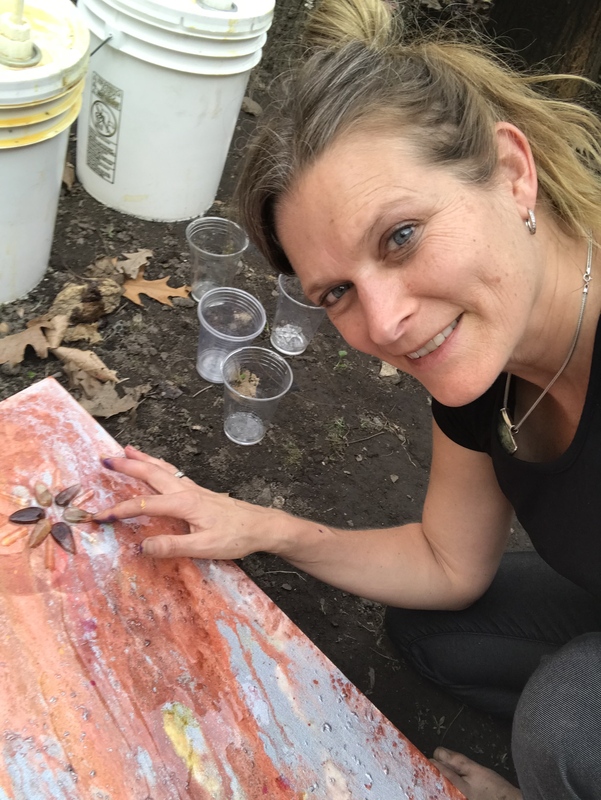 Painting outside allows the sunlight energy and earth energy to merge onto the canvas. The water poured flows around the crystals in the fundamental patterns of the meander, wave, drop and vortex spiral. Deeper meanings of the gemstones reveal themselves to me as I work with them in my life through art and energy healing practice. Pleiadian Seed Crystals – Rutilated quartz contains titanium fibers of gold and red that let your body accept itself. Titanium is not rejected by the body and the energy of this painting helps one heal physical issues, eating disorders and accept that they are part of the Earth and belong here. 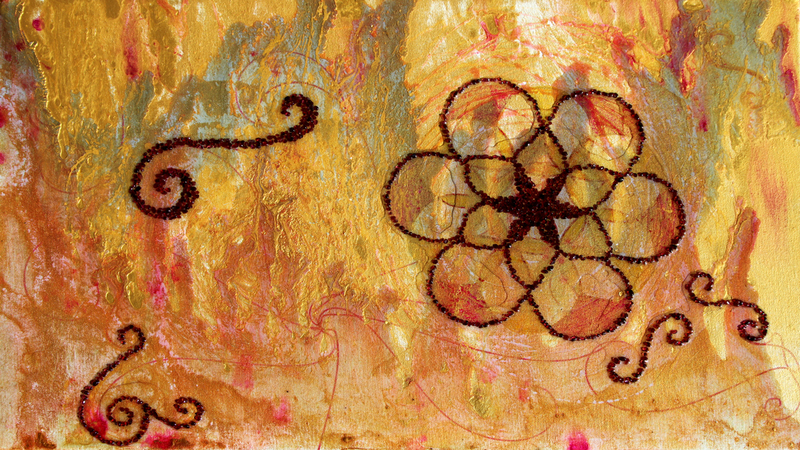 Morphogenetic Garnet Gestalt – Using semi-precious garnet gemstones, I created this painting with the flower of life pattern outline. The poured paint is with gold and aqua blue resin. 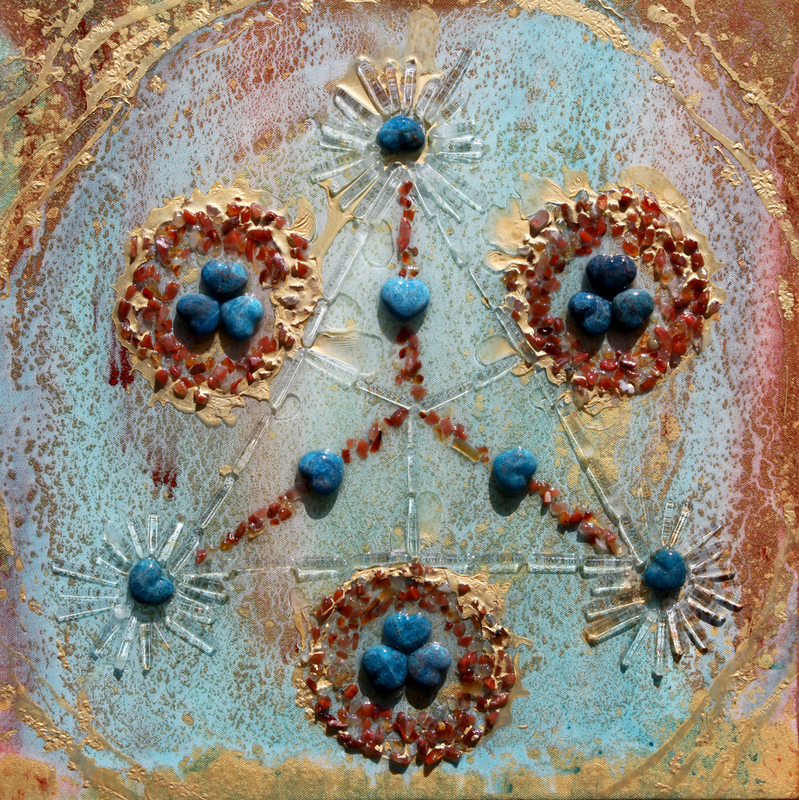 “Guardian Grid” is a crystal grid on canvas with Apatite, Carnelian and clear quartz points. The sacred geometry of the flower of life pattern is first hand drawn with a compass and then followed with an underpainting. 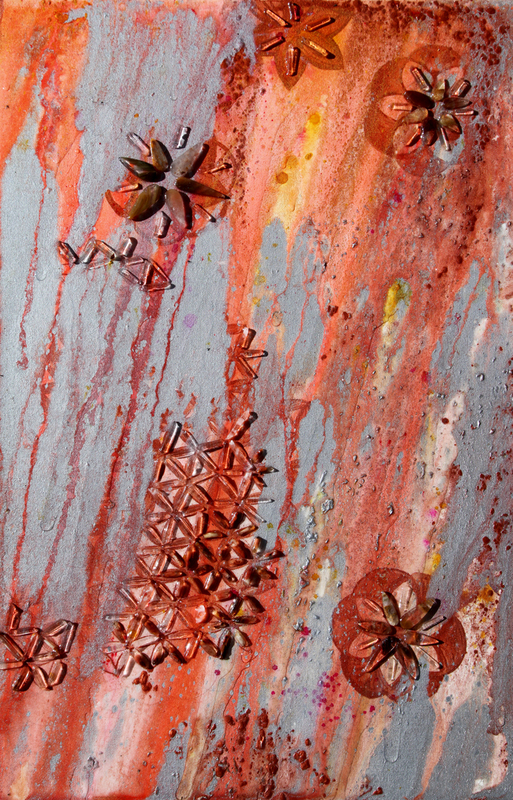 The crystals are poured on in a flow pattern and then set in place on the canvas. Grape Agate was the featured new crystal at the Gem Show. This beautiful purple orb emanates an energy needed right now on the planet. Small sparkling orbs receive your intentions and help manifest your reality. 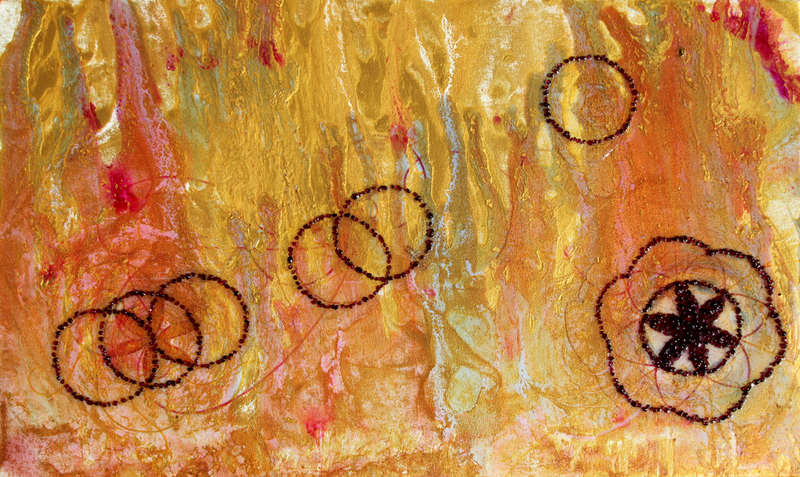 Geomantic Garnet Gestalt – This painting was created outside in the Autumn sunlight and reflects my research into empowerment, healing, consciousness and ancient wisdom. Andromedan Access – I utilize the flower of life pattern that is being revealed from below the fluid flow patterns of energy. Then I outline the pattern with various types of quartz crystals. Rutile quartz contains titanium fibers of gold and red that let your body accept itself.